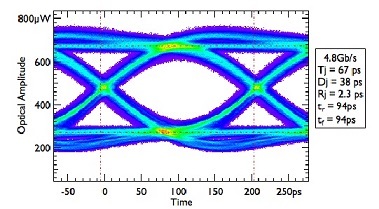 A laser driver for data transmission at 5 Gb/s has been developed as a part of the Giga Bit Transceiver (GBT) project. The Giga Bit Laser Driver (GBLD) targets High Energy Physics (HEP) applications for which radiation tolerance is mandatory.The GBLD ASIC can drive both VCSELs and some types of edge emitting lasers. It is essentially composed of two drivers capable of sinking up to 12 mA each from the load at a maximum data rate of 5 Gb/s, and of a current sink for the laser bias current. The laser driver include also pre-emphasis and duty cycle control capabilities.